You've heard it time and time again – this newest model is the best one yet; no, really, it is! This dialogue right here is an outstanding example of what sets VW apart from other car companies. So many competitors make these claims and can barely back them up, if at all. Volkswagen, on the other hand, knows better than this. Instead of telling you how special the all-new 2019 Jetta is, we'd rather show. With two more EPA-estimated city-mpg, the 2019 VW Jetta is significantly more fuel-efficient than its 2018 version. Getting further on the same amount of fuel, you're sure to find yourself making fewer stops at gas stations, plus that wad of cash in your pocket should be getting a little thicker, too. Newly standard for the 2019 production year, every model of the 2019 VW Jetta comes with Apple CarPlay, Android Auto, and full LED lighting. The integration of these awesome audio systems is made possible by the also newly standard Volkswagen Car-Net® App-Connect. With all of these technological upgrades, the Jetta is truly entering its next generation. While the focus of the 2019 vs 2018 Volkswagen Jetta comparison undeniably falls onto the 2019 model, it's worth mentioning that the 2018 version is still a very good car in its own right. It served its owners very well during its day, but the Jetta is entering its next generation and it's only natural that the more recent model will surpass its predecessor. Then again, without the 2018 one, there would be no 2019 Jetta! 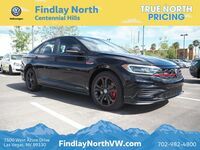 Whichever Jetta you may call your own, all of them have a played an important part in establishing this iconic legacy; all of them have paved the road for the innovative and wondrous 2019 Volkswagen Jetta.